This has been a really productive behind-the-scenes week for the tiny house. I met with the “trailer guy”, Danny Gallagher of Machine Works in Plant City. He generally builds boat trailers, but was interested in my project. As we looked at my drawings, he wondered why I didn’t have the framing built into the trailer. Because generally the idea is you buy a pre-existing trailer for a tiny house. But if you are having a custom trailer built, it would make sense to really build it as the foundation. This saves me 8″ in overall height, which can then be added to the interior. That will make my 6’2″ boyfriend happy, my ceiling height has gone from 6′ (duck, Tom!) to 6’8″. Also, the savings in framing lumber, insulation and flashing costs will be comparable to the added cost for the custom trailer. So, being excited about that, and as Danny wanted to see the house plans before he builds, I called Tumbleweed to see where they were on my design modification (pretty much just extending a 18′ Lusby to 20′). I told them about my trailer guy, they said they were getting into trailer building much like my idea, do I want to buy a trailer from them? I am wanting to keep business local here in Tampa, and ended up hooking Tumbleweed up with my trailer guy to discuss him being a east coast contractor for them. Cool beans! Oh, and my plans will be done on Monday. So back to Danny the trailer guy, he also suggested a product called SIPS instead of traditional framing. It’s a wall board product, kind of poly insulation sandwiched between two boards. It can span 30′ without studs. I researched the site, you send them your plans, they fabricate the stuff, cut your windows, install conduit and outlet boxes, and dovetail the corners so it all kind of snaps together like a giant gingerbread house kit. It replaces studs, exterior plywood, insulation, interior wall boards. You just snap it together and put on your exterior treatment, in my case, lap siding. So I have emailed them and asked for an estimate on that too, then I will compare to my estimated costs for all the componants it replaces. I also asked them if they had any experience with using the product on a trailer foundation (Rv’s) instead of a slab. In theory my tiny house will be rock solid, but I see a need for a little flexibility. Unfortunately, this is not something I can use scraps on, they custom make each piece to spec. So it will have to be comparable for me to stay on budget. Then, my tax return came in! So I have ordered all the water tanks, and will go buy the flexible tube plumbing and have that for Danny to put into the foundation. The tanks should be here in 2 weeks, and this is a 3 payday month. I will have the foundation for my tiny house by the end of March! Looks like today needs to be a make-room-in-the-backyard-for-a-tiny-house kind of a day! 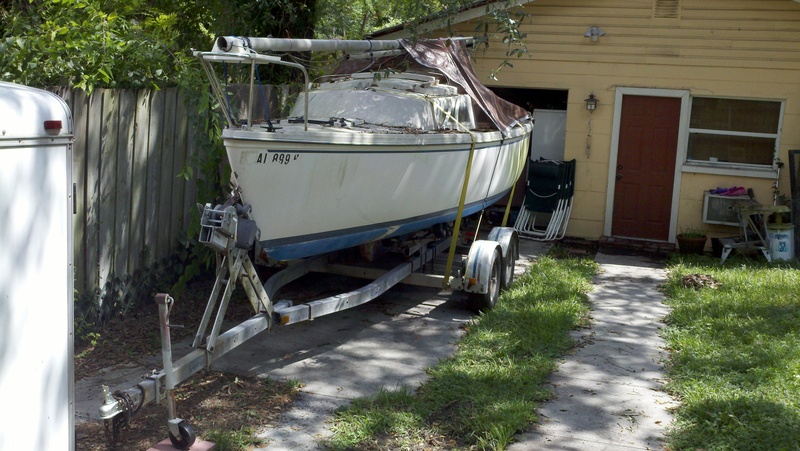 Anyone want a sailboat? I have moved on…..
Wow! I am just so impressed with your progress. This is moving along quite well. And love reading about your progress. As just a consideration at this point in the process….since you are already at 6′ 8″, why not add a bit more so that you can use standard doors (a standard door frame is 6′ 8″), especially for the front door which may end up saving you quite a bit over custom? I have never priced smaller doors so I don’t know if that would be worth it or not but it may save you aggravation later! I am so impressed with your progress! I did think about that, but in order to get it to scale I would have to go alot higher. I am ok with tall people having to duck to get in the door, just don’t want Tom to have to hunch over inside. I am already talking to to a local guy who tears out old houses, he has flooring, and will resize windows and doors to scale. I don’t think it will be too much more. Also, I have found a couple old doors on Craigslist that will work, then I can resize it myself.